Our medieval village, Eymet, has all the amenities that make country living so relaxing - boulangeries, bistros, bars; a Maison de la Presse (English newspapers, magazines & books for sale), Post Office, etc. There are also quite a few dining options - from a modest but delicious pizzeria where enthusiastic diners spill out onto the square nightly enjoying favorites and friends in a convivial setting to an elegant and exquisitely delicious restaurant that will remind you of Paris (except the prices!). Preparing food at home is a wonderful option, too - especially each Thursday when you come home with bags heavy laden with the ripest of fruits and freshest of produce. Twenty minutes by car and you’re at the fairy tale castle of Monbazillac, touring the Chateau or sipping the sweet white wine of the same name, which the locals drink with dessert or more often with another specialty of the region, foie gras. One of our favorite restaurants is in Monbazillac and the food is as good as the scenery is: spectacular. Ten minutes beyond Monbazillac finds you in Bergerac, the capital of the Perigord Poupre, made famous by the love-sick Musketeer, Cyrano. Bergerac's twice weekly Farmer’s Market engulfs the Church with fresh, local produce. Don't miss the Maison des Vins, where you may taste and sniff as many local wines are you are able. At Bergerac, you can explore Old Town by foot or take a relaxing gabarre (flat bottom boat) ride and travel lazily along the Dordogne River. Within a 30 minute radius, grand chateaux and simple wineries welcome you and offer you samples of their Bergerac sec (white wine), Pecharment (red wine) and of course Monbazillac wine. If you enjoy Farmer’s Markets, you can find one everyday and depending upon the season, you can gorge on white asparagus, tiny wild strawberries or perfectly ripened peaches. 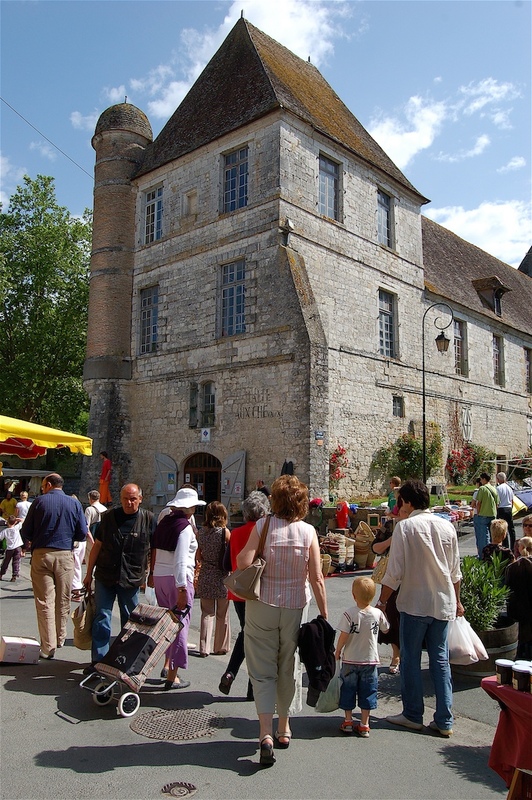 If you like antiquing or searching for bargains, then the brocantes (antique fairs) and vide greniers (literally empty the attic) held in different villages and towns each weekend throughout the summer, are for you. Our hometown has at least 3 during the summer. Sightseeing is easy with Petit Glycine as your base. 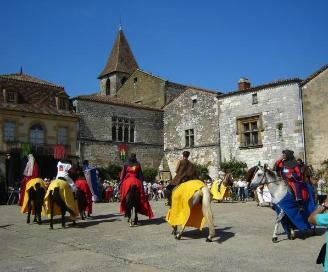 Beautifully preserved medieval hilltowns like Beynac and Castelnaud with their fabulous fortress chateaux, medieval bastides (planned towns) created by English and French rivals during the 100 Years Wars, of which nearby Monpazier is the best preserved. Then there are Sarlat and Brantome and their nearby Renaissance pleasure chateaux. And of course, there are the caves with prehistoric paintings from Lascaux to Font de Gaume and Rouffignac (where you visit the cave by electric train) that are not to be missed. From late July through mid-August, medieval fairs abound - with actors, dancers and musicians all in period costume, you'll be transported back in time.